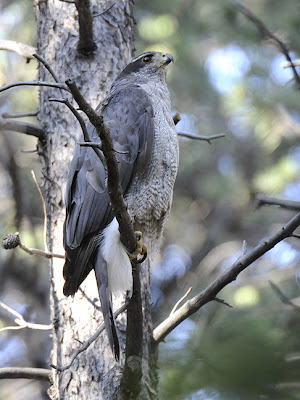 In my last post I reported on a visit to the nest of a remarkably powerful forest predator, the Northern Goshawk. 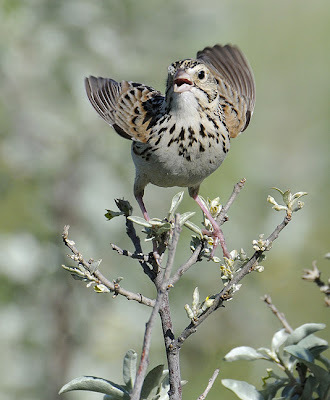 I also commented on the difficulty I'd had photographing the species until this year, when I finally got a distant flyby shots in the spring and then visiting the super cooperative birds in N. Colorado a few weeks ago. Well, to abuse a cliche, when it rains goshawks it pours goshawks! I just got back from a Southern California birding trip on Sunday, including a couple of days out on the Pacific Ocean (more on that in another post.) 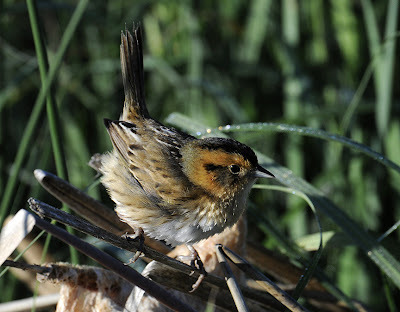 A few days prior to my boating adventures I was at the Santa Ynez River estuary where I crossed paths with Wes Fritz , who knows where every bird can be found and photographed in that part of the state (I'm not kidding- it is what he does! If you have holes in your list that you are trying to fill, engage his professional services and he'll go dawn to dusk or beyond to find birds with you.) In a major stroke of luck, it turned out that he wanted to go on a wild Gos chase to follow up on reports he'd heard of potential sightings at a campground in one of the coastal ranges, and many of my target birds could be found up there, too. So we decided to give it a try the next day. On the way up, Wes helped me get all of my wish list birds plus other SoCal goodies. 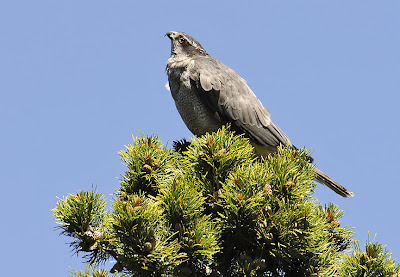 My targets acquired, now it was time to look into this goshawk business. 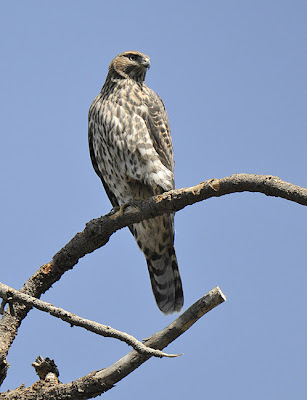 When we found the campground there was only 1 occupied campsite, and when we spoke to the gentleman there he said that indeed he had seen a hawk recently, sitting on his RV as it turned out! Oh, and would we like to see the pictures? 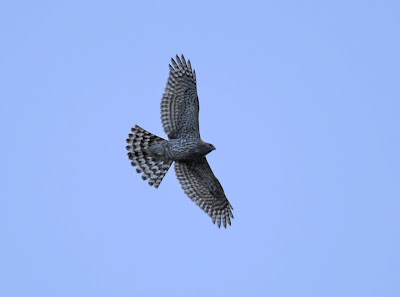 Yeah- while blurry, definitely GOSHAWK!! And then he volunteered that a few days prior, he and his wife heard and saw a noisy hawk just down the trail from the campground. It was making piercing calls- not the Hollywood raspy scream of a Red-tail. After getting a better description of the site, we set out down the trail to see what we could find. After about 1/2 mile, Wes spotted what looked like a potential Gos nest right over the trail in the top of a leaning snag. 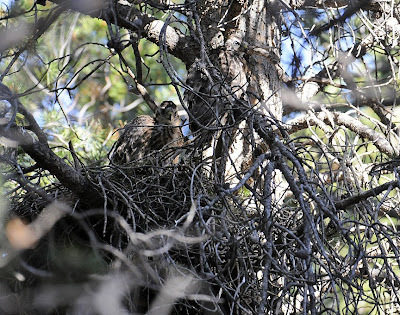 We worked for a while trying to get pics through the dense pine vegetation and estimate the nest height and diameter along with GPS coordinates to help out a mutual friend studying the species in S. California. Then a piercing set of calls began a bit farther along the trail. 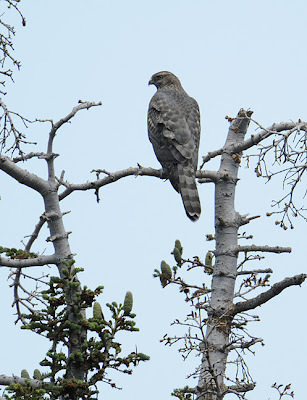 Jogging over, we were dumbstruck by a juvenile Goshawk perched in the top of a tree downslope from the trail! Wes started videotaping and I started hammering with the DSLR. Not long out of the nest, it and a sibling were hanging out in the vicinity, sometimes calling, sometimes quiet, alternating short circling flights with perching, no doubt waiting for mom or dad to bring back some food. At one point an adult blasted by high overhead, probably just keeping tabs on juniors 1 & 2. This is a pretty remarkable location for nesting Goshawks, on the extreme southwestern edge of their breeding grounds in California. In fact, the nest was under 40 miles from the beach, putting it beyond most breeding range maps for the species. At one point, one of the juvs landed on a branch directly over me, probably curious in the way of some young birds. It called some more, a most spine-tingling experience at point-blank range, while its sibling called from downslope. Needless to say, we returned from the outing quite excited. 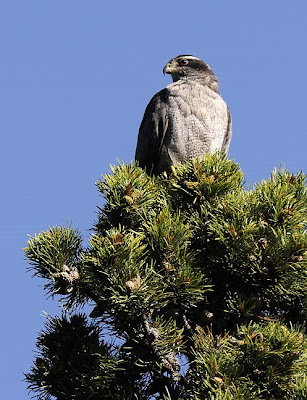 I recently had the supremely rare opportunity of accompanying a bird bander and researcher to a Northern Goshawk nest site in Northern Colorado (sorry I can't be any more specific than that.) 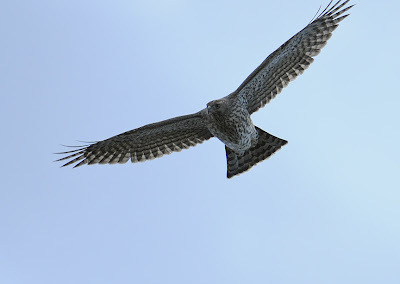 Usually, Goshawks let you know when you get too close to their nests by screaming and strafing you, with about the only good option being to retreat. Surprisingly, though, this pair was very mellow, with the researcher reporting only one close flyover and generally no more than curious onlooking on visits to check on the progress of the chicks. For this reason, the researcher thought that bringing in a photographer wouldn't stress the birds, and for that I'm extremely grateful. 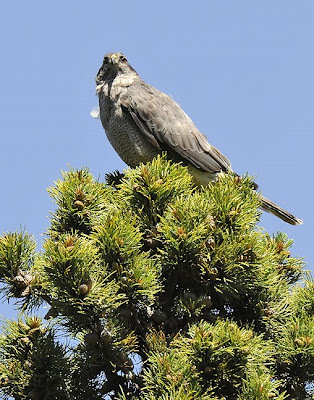 On my visit, the female (told by the heavier reddish barring on the underparts) flew in from nearby as we neared the nest but just perched down in the shady understory for a bit before flying up to the sunny top of a tall lodgepole pine. It stayed up there where it could see us and the nest at the same time, never vocalizing or looking agitated, and eventually started napping! Now that's mellow behavior for any raptor, especially one with the fierce reputation of a Goshawk. I suspect the male was around too, but we never saw him during our visit. The chicks were ripping at some prey item between bouts of resting, so I think the pressure was off the adults to deliver more food for a while and they were just taking it easy. 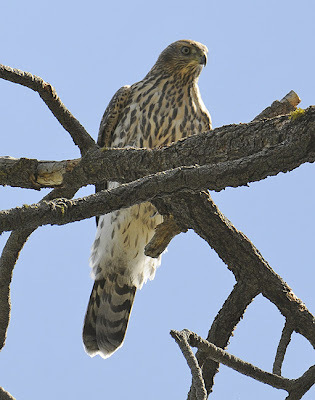 The nest held two new Goshawks, one just beginning to explore a nearby branch. Within a week of this visit I'm told they had left the nest tree and had disappeared into the forest- I'm glad I made it in time to see this amazing sight. Like owls? (Who doesn't??) I just got a great new book that details some of my favorites- the wee owls of the mountains. Scott Rashid (bird artist/bander/researcher/rehabilitator) has written and illustrated a wonderful reference on small owls, with detailed chapters on 4 species that inhabit the Rockies (Northern Pygmy, Flammulated, Northern Saw-whet, and Boreal Owls.) Appropriately titled Small Mountain Owls, Scott blends personal stories of his many encounters (often supplemented with detailed illustrations), research findings, and photographs of these secretive owls. There's a lot for anybody to learn here- much of Scott's research represents previously undocumented behaviors and facts about these fascinating birds. Get a copy for yourself and/or an owl fan in your life! 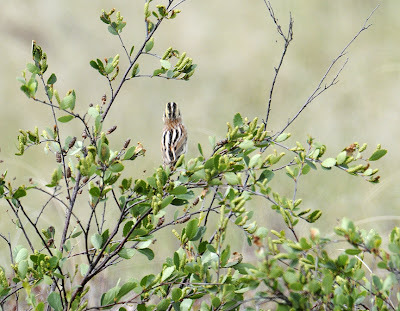 I think a major highlight of my birding summer so far has been the chance to study all 5 of the Ammodramus Sparrows that occur in the interior US (you have to go coastal to see Saltmarsh Sharp-tailed Sparrow and Seaside Sparrow, a geographic feature my travels in Wisconsin, Minnesota, and North Dakota lacked.) For an overview of this genus, I'll also plug a great new resource- David Sibley has put is seminal field guide online! 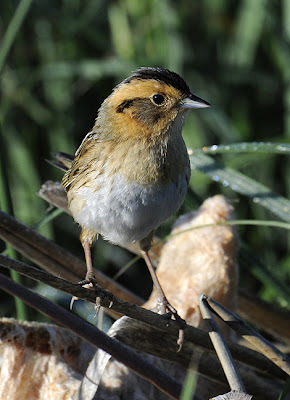 Link to his section on Emberizine Sparrows and Allies and scroll down to see an overview of the 7 North American Ammodramus (I'll also link to each one.) If I were to summarize this genus, I'd say "small, secretive, shrill (voiced), and subtle" (field marks.) Two were new to me, and I was excited not only to see them but to photograph them all (however poorly in a couple of cases.) 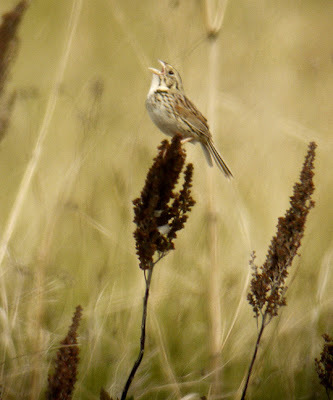 The first lifer I got was Henslow's Sparrow. I wasn't expecting this one, being north of their regular range, but one was a bit north of normal at Crex Meadows, a fantastic state wildlife area in Burnett County, Wisconsin. Andy Paulios, the Wisconsin eBird reviewer, very handsomely provided me with directions to the territory. As is usually the case with Ammodramus, I heard the bird for quite a while before I finally tracked the little guy down singing from a weedy tassel (I'm no botanist so I don't know what this plant is.) I only got digiscoped pics through atrociously bad air, but you'll see the extensive rufous in the wings and the greenish wash on the lighter areas of the head. 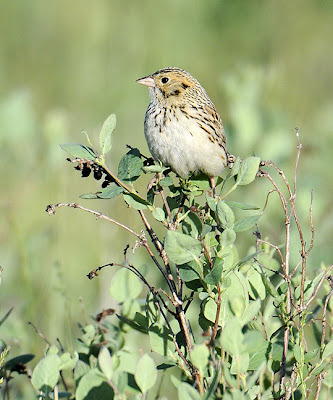 (In his sparrow ID workshop at the ABA Conference in Minot, Jon Dunn said it's like Henslow's had its head dipped in pea soup.) 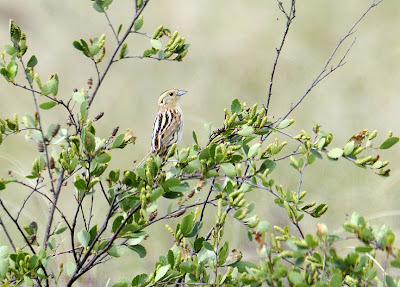 Another Ammodramus I heard and saw at the same spot was Le Conte's Sparrow. These guys have a really lemony-yellow wash to their head and an boldly striped back and crown. I didn't work on photos too hard since I already had some decent pics of the species. Very dapper birds, Le Conte's like it pretty moist underfoot. On my way to the Minot ABA conference I stopped at Chase Lake NWR near Jamestown. I was hoping to find a pre-conference Baird's Sparrow but struck out. 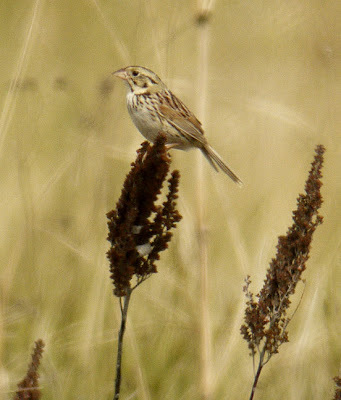 I did have this mightily-buzzing Grasshopper Sparrow along a back road, though. They are more buffy overall but have yellow above and in front of the eye, plus a little on the leading edge of the folded wing. Their bodies are unstreaked and they have a prominent spot at the back of the auriculars (feathers behind and below the eye.) 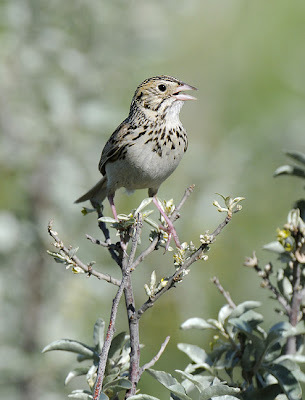 The second lifer Ammodramus I gleaned on this northern plains jaunt was Baird's Sparrow. Our field trip to Lostwood NWR turned up several, and I was happy to get scope looks along with all of the participants. I also really learned the song- nothing like hearing a bird sing (however softly) as you are watching it to gel up the audio-visual neural connections. After the conference was over I went back to the refuge on my own and found a stretch of the auto tour with 3 or 4 competing males in bushy clumps next to the road. The pics below were taken out my car window- don't forget the power of using your vehicle for a blind when possible (and safe.) This refuge is one of the best places in North Dakota to find this species due to their grassland management plan that included prescribed burns and grazing rotations that mimic bison foraging patterns- heavy for a while and then a few years of rest. Without fire, the grassland gets too brushy and wooded, and with over-grazing the grass gets too short. 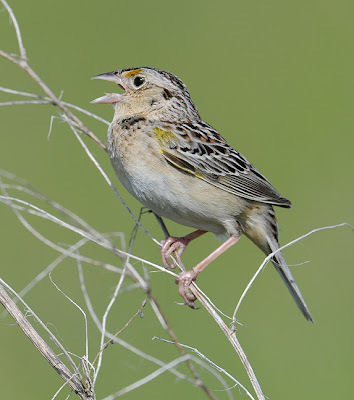 Unfortunately, over much of the Baird's Sparrow's historic range one or the other negative impacts has made the landscape unsuitable for this tidy little bird. Note the dark border on the back of the auriculars is thickest at the top and bottom rear corners, so from many angles it looks like the bird has two spots towards the back of the head. It also has a pale orange wash over the light parts of the head- Jon Dunn relates this to a wash in pumpkin juice. The 5th Ammodramus of my trip (and the last one possible without a detour of perhaps 1500 miles east, was Nelson's Sharp-tailed Sparrow (probably soon to be shortened by the AOU to just Nelson's Sparrow.) 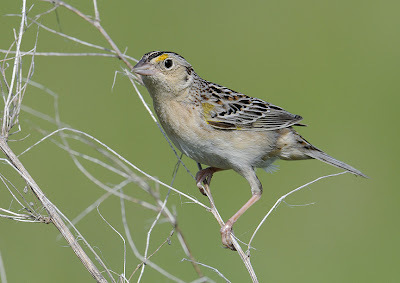 I heard these at several places in North Dakota, but for me this has always been a very difficult sparrow to see. First of all, it sings most at night, or in the dim dusk and dawn periods. Secondly, even when it is singing in daylight it is often well hidden in its preferred marshy sedges, reeds, or cattails. Its song is very short, thin and high pitched with a wheezy, hissed quality that makes directional locating and distance estimation a challenge. Also, since it likes such a marshy habitat it can be hard to approach without hip boots or a willingness to get pretty wet (and often a bad idea anyway from a habitat protection perspective.) Fortunately, though, the tour road at Lostwood NWR went through a low spot with marsh right up to the road's edge on either side. This was home to at least two Nelson's Sparrows (and a Le Conte's, and I was able to photograph a really orange-faced one out my car window. In my superficial little mind, this is my favorite Ammodramus for looks (on those rare occasions where you can see one well), but the poorest vocalist among an already weak-sounding bunch. Oh, and in the second pic I think you'll see how Sharp-tailed Sparrows got their name... Ammodramus Country: I'll guarantee there are 4 species of Ammodramus sparrows in this picture! (composite taken from the fire watch tower at Lostwood NWR.) Nelson's in the emergent marshy veg around the potholes, Le Conte's in the thickest, wettest grass right above the marshes, Grasshopper and Baird's up in the healthy, dryer native grasses.